Silver-gilt, embossed and chased with applied cast elements. The central figure modelled and cast (the cloak cast separately), the base of this figure engraved '*DOMITIANVS*'; the bowl embossed and chased with four scenes from the life of the Emperor Tiberius; the foot a nineteenth-century replacement, possibly Spanish, 1550-1600 or made 1850-1890. There are inscriptions or marks on all the original sections of the tazza. *DOMITIANVS* (the 'N' reversed) on the plinth upon which the figure stands. The relatively crude execution suggests was added at a slightly later date. Engraved on the inner rim of the bowl: the Arabic numerals '1' to '4' above the four scenes embossed round the inside of the bowl. 'VESPASIANVS' (the 'N' reversed) and the number '10' engraved on the inside (ungilded) side of the circular plate screwed to the underside of the bowl. On the underside of the plate on which the emperor stands: seven vertical scratched marks and two curved ones. a vertical line and three dots on the circular fixing plate around the screw, opposite the assay mark: l . . .
On the replacement foot: two vertical marks on the underside of the base and a single vertical scratched mark at the top of the base section beside the screw hole. On the underside of the circular plate fixed to the underside of the bowl: a 'weevil' in an oval frame, French import mark for gold and silver imported from countries with Customs Conventions, and in force from June 1 1864. Height: 42 cm Foot to top of figure in centre of bowl, Diameter: 37.5 cm Across centre of bowl, Diameter: 18 cm Across underside of foot, Weight: 2910.2 g Combined weight of dismantled sections, taken by Pippa Shirley. 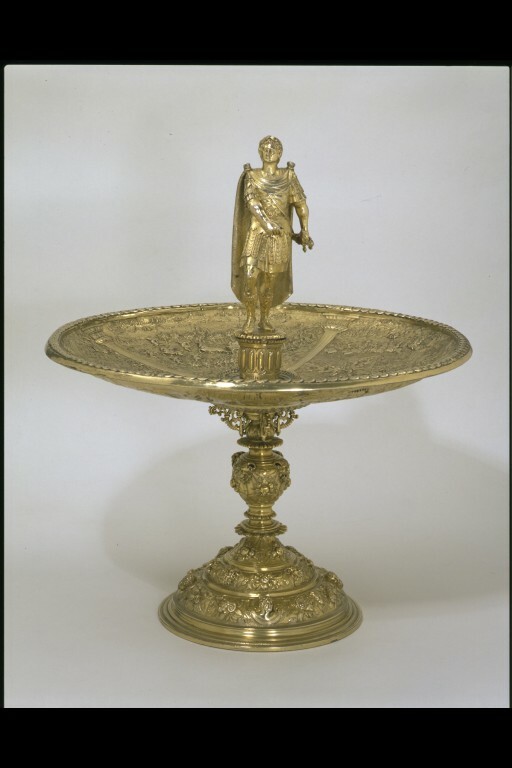 One of a set of twelve standing dishes ('tazze' in Italian) bearing figures of the first twelve Caesars of Imperial Rome. Made no earlier than 1587 and completed by 1599, they are one of the most spectacular groups of 16th century silver to survive. They were owned in the late 16th century by a member of the Aldobrandini family, possibly Ippolito Aldobrandini the Elder, later Pope Clement VIII, no doubt to make an impressive display in his palace. The set had an eventful history. They were still a set of twelve in 1861 but six of them, including this one, were later bought by the 19th century Austrian art dealer and collector Frédéric Spitzer (1815-90), who 'improved' them by apparently replacing the original stems with versions modelled on a different 16th century stem. Despite these vicissitudes, all twelve survive today in different collections across the world. 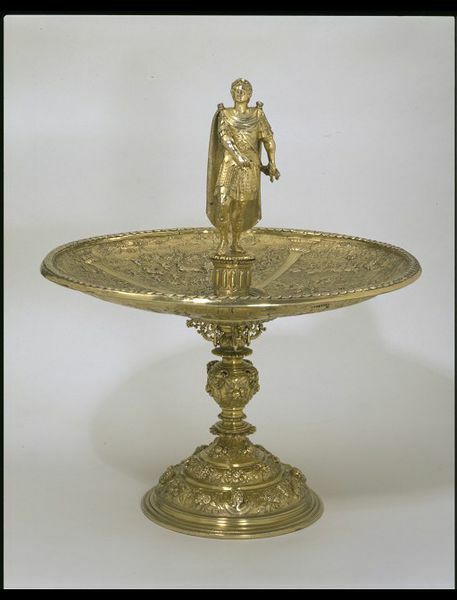 Tazza, silver-gilt, the bowl embossed and chased with four scenes from the life of the Emperor Tiberius, in the centre of the bowl the cast figure of the Emperor Domitian. Hayward, J. F. The Aldobrandini Tazzas, Burlington Magazine, October 1970, pp. 669-74. Works of art from the Wernher Collection, Christie's London, Sale 6293, 7 July 2000, lot 19. Suetonius, The Lives of the Twelve Caesars. London, Penguin. Siemon, Julia, ed. The Silver Caesars. A Renaissance Mystery. The Metropolitan Museum of Art Symposia. Catalogue of the exhibition held at the Metropolitan Museum, New York, 12 December 2017 to 11 March 2018, and at Waddesdon Manor, Buckinghamshire, 18 April to 21 July 2018. New York: Metropolitan Museum, 2017. ISBN 9781588396396. Carré, Louis. A Guide to Old French Plate. London: Eyre & Spottiswoode, 1931, repr. 1971. The figure and bowl probably the southern Netherlands (modern Belgium), about 1587–1599, French import mark for 1864 onwards. The figure standing triumphantly atop this footed cup (tazza) is the Roman emperor Domitian. However, the bowl is decorated with scenes from the life of another emperor, Tiberius, taken from an account by the Roman historian Suetonius. This cup was originally part of a set of twelve tazze, all of which survive today in different collections. Over time, the interchangeable parts of the tazze – the bowls and figures – have been mixed up, resulting in mis-matched emperors and bowls. The set is known as the ‘Aldobrandini Tazze’, but it was not commissioned for this family. Instead, the design celebrating emperors as victorious leaders and wise rulers was calculated to appeal to the Habsburg dynasty, who controlled much of Europe in the late 16th century and traced their ancestors to the earliest Roman emperors. The tazze were probably originally presented by town authorities to a Habsburg governor-general of the southern Netherlands, possibly Archduke Ernest of Austria (d. 1595), or his brother and successor Albert (d. 1621). By 1604, however, a letter describes them among the sumptuous display of silver at a banquet organized by Cardinal Pietro Aldobrandini at his palace in Rome. The Roman Emperor Domitian in military dress stands on a fluted column in the centre of the salver, which shows scenes from his life: on a chariot, in battle, a triumph scene and his elevation to a divine status. This was one of a set of twelve spectacular tazze (salver with stemmed foot) bearing figures of the first Caesars of Imperial Rome. In the late 16th century they were owned by a member of the Aldobrandini family, possibly Cardinal Ippolito Aldobrandini the Elder, later Pope Clement VIII (1592-1605). In the 1860s the Austrian collector and art dealer Frédéric Spitzer (1815-1890) bought six of the tazze, including this one. He replaced the original fluted stemmed foot with a more elaborate Renaissance style one of the 16th century with swags of fruit and drapery, cherubs and satyrs and male Roman heads. The dish and figure about 1570-92; the stem and foot about 1530-70, and from a SPANISH monstrance. 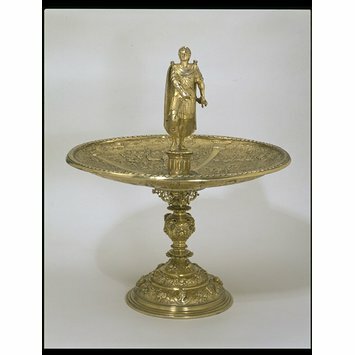 This is one of a set of 12 tazze (standing dishes) bearing figures of the first 12 Caesars of Imperial Rome. Made about 1560-70, they are one of the most spectacular groups of 16th-century silver to survive. They were owned in the late 16th century by a member of the Aldobrandini family, possibly Ippolito Aldobrandini the Elder, later Pope Clement VIII, no doubt to make an impressive display in his palace. The Emperor Domitian stands on a fluted column in the centre of this bowl, which is decorated with scenes from his life.